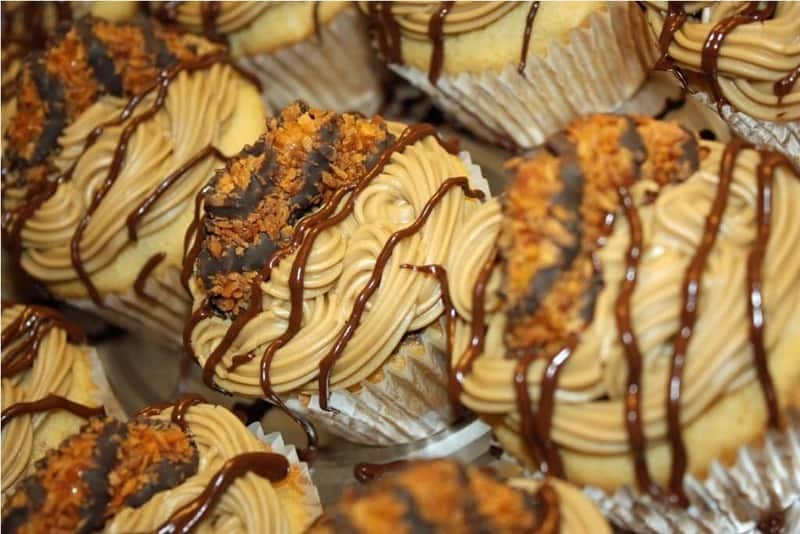 Your favorite Girl Scout cookies transformed into decadent, delicious Samoa Cupcakes! Several weeks ago I ordered many many boxes of Girl Scout cookies from my beautiful niece, Ashley. Well… I’ve been holding on to those cookies until I had enough time to create the cupcake made from one of the most popular GS cookies, the Samoa. And you know what… I think I’ve done it. Now, I’ve made a few cupcakes that were pretty damn good before… but these, well these cupcakes my friend are probably one of my BEST creations. Now… before I go any further, I must take a moment to thank Rudy from Man Bakes Cake in helping me come up with the recipe for this cupcake. I was admiring his version of the cupcake and asked on his Facebook if he had a recipe. We exchanged a few emails in which he explained the basic process and ingredients for making his version of the Samoa cupcake. I took a few of his ideas and ran with it! I would have never thought to use one of the main ingredients in this recipe… coconut milk… but it really makes this cupcake AMAZING! So thank you MAN BAKES CAKE for the inspiration and direction in making this cupcake! So let me tell you about this cupcake. 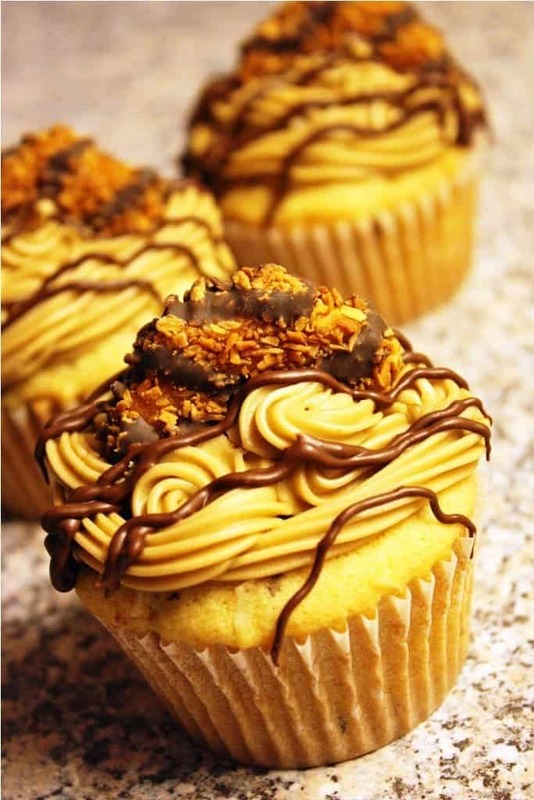 This Samoa cupcake starts with a brown sugar base. Now, most cupcake recipes I use call for some kind of liquid to be added, usually milk, but for this cupcake we use coconut milk. That combination of brown sugar and coconut make for a perfect Samoa flavor. For some crunch and added flavor, I’ve mixed in an entire box of Samoa cookies and some coconut flakes into the batter. 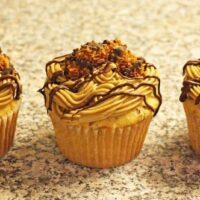 The cupcake is topped with a caramel coconut frosting. This frosting is also made with the coconut milk. I guess you could say that coconut milk is the secret ingredient of this cupcake. I’ve never worked with it before, but I’ll definitely be using it again when I need a rich coconut flavor. The chocolate drizzle on top is just a semi-sweet chocolate, but it’s a perfect pairing with the caramel flavors and coconut. So… I won’t keep you from the recipe any further! Enjoy! Preheat oven to 375 degrees. Line cupcake pan with 24 liners. In a mixer, beat butter on high until soft. Slowly add sugar and beat until light and creamy. Add eggs one at a time, making sure to beat well after each egg. Add the coconut extract and mix until incorporated. Whisk together flour, baking powder, baking soda, and salt in a bowl and set aside. Measure out the coconut milk and set aside. Add about ¼ of the flour mixture followed by 1/3 of the milk mixture. Repeat this step until you end with the flour mixture. Mix just until incorporated. Fill cupcake liners with batter about ¾ full. Bake for 10 minutes then rotate pan. Bake another 5-7 minute or until cupcakes are golden brown. Let cool in pan for at least 5 minutes before transferring to cooling rack to completely cool before frosting. 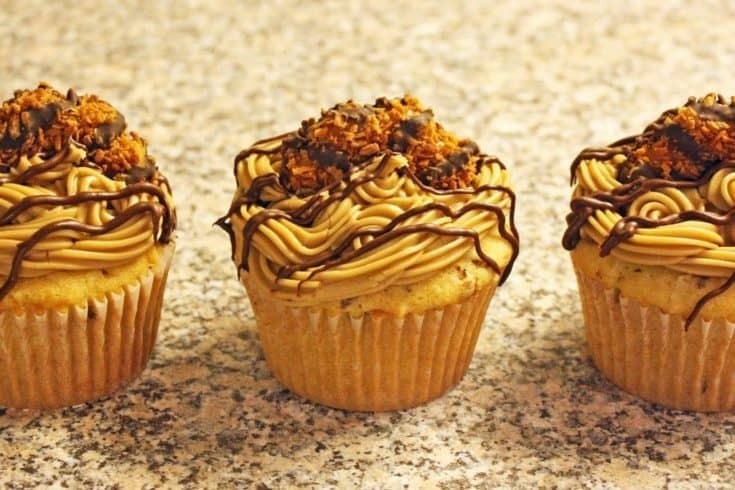 Frost with caramel coconut frosting, drizzle with melted chocolate and top with ½ a Samoa cookie. In a small pan, melt the butter on medium high heat. Stir in the coconut milk and coconut extract. Slowly add the brown sugar and stir until completely dissolved, about 2-3 minutes. Do not let the mixture boil. oz at a time add the sifted powdered sugar and mix with a hand mixer. Scrape the sides of the bowl after each addition. If necessary, add up to 2 tbsp more coconut milk to create the consistency you want. Mix on high about 2 minutes, scraping sides making sure all the sugar is incorporated. Work quickly to frost the cupcakes, the frosting will be warm but hardens quickly and is harder to work with. The frosting will still be warm when it's ready to be used. Make sure you're ready to frost your cupcakes as soon as the frosting is ready! Once it cools, it will set up and harden, making any piping or spreading more difficult to do. These sound amazing… I am on the look out for a generic brand of these cookies so I can give this a try and not have to wait until next year.. would love to see a picture of the inside of one.. possible? Have you seen Keeblers version of the Samoa cookie? Tastes almost identical to me just more of a milk chocolate coating on the bottom whereas the GS Samoas have what looks like a dark chocolate. I plan on trying this recipe! I found some a couple of weeks ago called Coconut Dreams by Keebler. I’ve never seen them before so I don’t know if they’re new or just a “seasonal” thing. Tastes the same….sooo good. I’m making a tweaked version of this cupcake recipe right now. Left out the coconut and cookie bits from the cake batter because I don’t have enough cookies on hand. I filled them with ganache instead and going to top frosting with toasted coconut and drizzle ganache and place cookie on top same as here. Can’t wait to sink my teeth in to one. great we are all out of girlscout cookies but going to make the cupckae without the cookies sounds delish…where was this recipe when i was trying to make a coconut cake for a baby shower a couple weeks ago, thank you for sharing..was man cakes on cupcake wars? Dollar General stores carry a similar cookie in their Clover Valley line……I bought them on a whim not expecting very much, But, the taste is almost identical! Give’em a try. I’ve tried this recipe twice now and both times the cupcakes brown very dark on the top while staying raw in the middle by the 13th minute. Is 375 the correct oven temp? I will try it again, but with a 350 or 325 temp instead. Or any other suggestions? Thanks! I’m sorry you’re having problems with this cupcake! 🙁 I have a couple of ideas for you… First, do you have an external thermometer you can put in your oven to test the temperature? I hang one from the middle/back of my oven rack to make sure I am baking at the correct temperature. The oven in the house I am living in now bakes 25 degrees cooler than what I need it to, so I have to boost up the temp every time I bake. But, I make sure to check the thermometer I put inside after it beeps and before I bake for accurate temps. Second, if your oven is cooking hot… .then yes, absolutely reduce the temperature down 25 or even 50 degrees. But make sure you watch them, they will take longer to bake. Also, try rotating the pan half way through baking. This will help create more even baking throughout your entire pan of cupcakes. Good luck! And I’m sorry your oven is being temperamental!!! Let me know how it works out! Thank you so much! I will definitely try this next time. Oh, and I am CRAZZZZY for this frosting! I tried out this cupcake tonight and I don’t know if I did something wrong – but the consistency was more like a muffin than a cupcake. Also, I wasn’t able to really decorate with the frosting, not sure if it was because it was still warm or if I again did something wrong. But I still loved this recipe! I’m sorry! I’ll be making them again this year and I’ll let you know if I do anything to tweak the recipe. You’re right though, the frosting is a little hard to work with if it cools too quickly, but seriously… it’s SO DELICIOUS that I don’t think anyone will mind if it’s not perfect looking! These look amazing!! I love Samoa cookies more than any cookie in the world! I will be making these sooner rather than later! I am currently making the Samoa cupcakes and icing. The cupcakes are awesome!! But a question about the icing… When should the coconut extract be added when making the icing? Thanks for the great recipe! I updated the instructions! Thanks for catching that omission! <3 Take pictures and let me know how they turn out for you! THANK YOU. These cupcakes are incredible! I made them recently and absolutely LOVED them!! Start with 1/2 a tsp and go from there. You can always add more, but you can’t take it away! When you’re referring to Coconut Milk, are you talking about the kind you find in the dairy section or the canned kind? I am in England. We don’t have Girl Scouts or Samoa cookies. What can I use instead ? Any coconut and chocolate cookie would do! 🙂 Keebler makes a cookie that is similar to the Samoa! Do you use 1 and 1/2 sticks of butter in the cupcakes and the rest in the frosting?